Topco Associates has 50 member-owners that collectively represent nearly $170 billion in sales and thousands of stores. The membership includes supermarket retailers, wholesale distributors, foodservice and pharmacy companies. Alex Lee is the parent company of Lowes Food Stores, Inc., Merchants Distributors, Inc. (MDI) and Institution Food House, Inc. (IFH). Lowes operates more than 100 stores in North Carolina, South Carolina and Virginia. Serves nearly 500 grocers in eight western states. Serves approximately 300 independent retail stores in Louisiana, Mississippi and Texas. Serves more than 300 independent grocers in Alabama, Georgia, Mississippi, Tennessee and the panhandle of Florida. Operates more than 130 stores under five formats in Arizona, California and New Mexico. Operates more than 60 retail stores throughout Massachusetts and Connecticut. The employee-owned company has more than 7,000 associates across nine banners: Brookshire Brothers, Brookshire Brothers Pharmacy, Brookshire Brothers Express, Cormie's Grocery, Tobacco Barn, David's, David's Express, Pecan Foods and Polk PIck-It-Up. Operates more than 150 stores in Texas, Louisiana, Mississippi and Arkansas. Provides distribution services to grocery chains and independent stores, delivering to more than 5,000 locations from distribution centers located in 11 states. Centro Cuesta Nacional, C. por. A. Operates 22 stores in the Dominican Republic. Distributes to more than 140 independent supermarkets in Wisconsin, Minnesota, northern Illinois and eastern Iowa. Operates more than 35 conventional grocery stores and superstores in the upper Midwest under the Coborn's and Cash Wise banners. Operates more than 16 stores in Ohio under the Acme Fresh Market banner. Formed in 1954, Frost Acres Brands is a national marketing and food purchasing cooperative dedicated to aligning and unifying the sales, marketing and procurement activities of its members in order to produce sustainable growth and member business wealth. Operates more than 215 stores throughout western Pennsylvania, Ohio, northern West Virginia and western Maryland. Operates more than 125 stores in Connecticut, Massachusetts, New Hampshire, New York, Pennsylvania and Vermont. An employee-owned corporation operating approximately 230 retail stores across eight Midwestern states. Serves more than 2,000 chain and independent supermarket locations throughout the Northeast and Mid-Atlantic states. Operates more than 50 stores in New York under the King Kullen and Wild by Nature banners. Operates 100 stores in Kentucky, Virginia and Tennessee under the Food City and Super Dollar banners. Operates more than 66 stores in Mexico and serves the import needs exclusively for S-MART Mexicana. Serves more than 600 independent retailers in Kentucky, Tennessee, Georgia, West Virgina, Illinois, Indiana and Ohio. Operates more than 20 stores in Minnesota under the Lunds and Byerly’s formats. A pioneer of the supercenter concept operating more than 200 stores throughout Illinois, Indiana, Kentucky, Michigan and Ohio. Serves more than 250 independent supermarkets in the Southeast. To be a partner in the success of our independent retail Members by providing excellent customer service, value, and support. A broadline purchasing and marketing group with more than 180 independent food service and convenience store distributor members across the United States. Golbon is a division of Oppenheimer Companies, Inc. Currently serving more than 270 stores in seven states. Supplies more than 120 stores in Wisconsin and Illinois. Operates 22 Pueblo supermarkets stores and a distribution center. Operates more than 100 convenience stores throughout New Jersey and southern New York. Operates more than 130 stores in northern California and Nevada under the Raley’s, Bel Air Markets, Nob Hill Foods and Food Source banners. Operates nearly 240 stores in California and Nevada under the Save Mart, S-Mart Foods, Lucky and Food Maxx banners. Operates more than 100 stores in Missouri, Illinois, Indiana, Wisconsin, Tennessee, Mississippi and Iowa. Southeastern Grocers, parent company of BI-LO, Harveys and Winn-Dixie grocery stores, is the fifth-largest conventional supermarket chain in the U.S. and the second-largest conventional supermarket in the southeast based on store count. SpartanNash (SPTN) is a Fortune 400 company and the largest food distributor serving US military commissaries and exchanges in the world, in terms of revenue. The Company’s core businesses include distributing food to military commissaries and exchanges, and supplying independent grocery retailers, as well as our corporate-owned retail stores located in 46 states and the District of Columbia, Europe, Cuba, Puerto Rico, Bahrain and Egypt. SpartanNash currently operates 160 grocery supermarkets, primarily under the banners of Family Fare Supermarkets, No Frills, Bag ‘n Save, Econofoods, and Dan’s Supermarket. Operates more than 165 full service supermarkets in Southern California. Operates more than 120 full-service supermarkets and five franchise supermarkets in western and central New York and northwestern Pennsylvania. Services over 160 grocery stores and over 1,500 hotels, restaurants, and convenience stores. 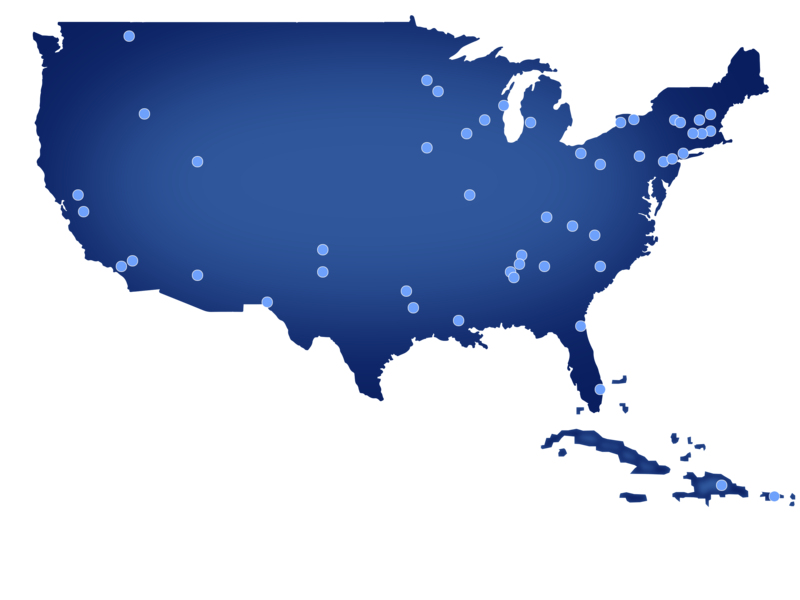 Services approximately 100 stores in the states of South Carolina, North Carolina and Georgia. Largest retailer-owned wholesale cooperative in the United States servicing more than 300 supermarkets across nine states in the northeastern market. Operates more than 75 stores primarily in New York, Pennsylvania, New Jersey, Virginia and Maryland. Operates more than 200 stores in seven states including Pennsylvania, Maryland, New Jersey, New York, Delaware, Virginia and West Virginia. A nationwide member-owned cooperative that represents over 2,200 independent pharmacies, providing owners an opportunity to buy like a large chain. A retail pharmacy chain with 21 retail locations throughout Eastern Iowa, Northwest Illinois and Southwest Wisconsin, providing pharmacy and convenience retail items. A family-owned retail grocery chain with 41 locations throughout Southern California.